This month’s Genre has been chosen by Vinnie of Vinnie H. and it is Historical True Story Films. Brief Synopsis – While her sister is Queen, young Elizabeth is accused of being a heretic and kept under house arrest before she ascends the throne herself. My Take on it – I saw this film once 17 years ago and hated it. This was definitely not one of the films I was looking forward to re-watching, but since I’m trying to watch and review all Oscar Nominees by this years upcoming award show AND because it fits this month’s Genre, I decided to give it a try. Boy am I glad I did so because I absolutely loved this film and have no clue why my younger self wasn’t able to appreciate it at all. Cate Blanchett is absolutely spellbinding as the Virgin Queen and I’m not surprised that she won so many awards for this role. Besides Blanchett, the supporting cast is superb and they all make this film so interesting and intriguing to watch the entire time as things are always constantly in motion both on and off camera. They do a wonderful job showing us how difficult, dangerous and trying the life of a Monarch at that time can truly be. The way they present both the political and romantic intrigue in the story is also great because they are able to find a way to weave both aspects together really well to a point where sometimes one cannot see the difference between them. We are given a very clear sense of the many trials, tribulations and difficulties she had upon ascending the Throne of England. After having seen this, I’m now quite intrigued and excited to finally see the sequel to this film which uses the main cast and director. It was nominated for Best Picture in an extremely competitive year, but I would probably still only rank it at #3 eventhough is was amazing. Bottom Line – So much more enjoyable this time than it was when I saw this years ago. Blanchett is spellbinding in the title role. Amazing supporting cast helps keep things so intriguing and interesting the entire time. The way that they show us how difficult and dangerous the life of a Monarch was during those times is done exceptionally well. The political and romantic intrigue is woven really well topgether and we get a clear sense of the many difficulties that she had after she ascended the throne. Now I’m looking forwrad to fionally watching the sequel. Highly Recommended! Genre Grandeur Worthy? – Most definitely, this film has so much going for it including political intrigue and gives us so much insight into the life of a Monarch during that time. Thrilled to hear you loved it. 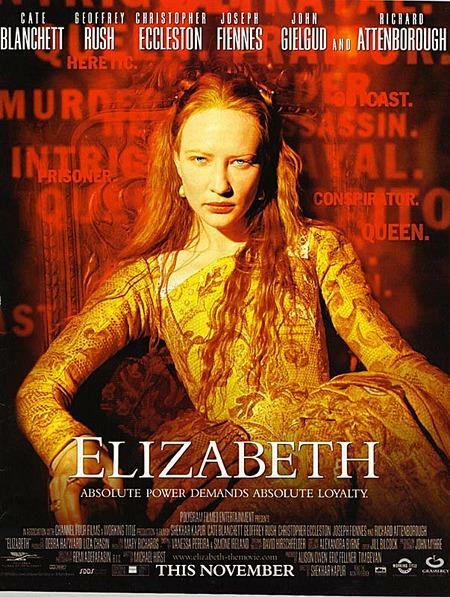 Blanchett is a revelation as the young queen.